A rendering of the SDSU Mission Valley official site plan. Three San Diego County Supervisors announced their support for Measure G Thursday, less than one week before San Diego voters decide the fate of the SDCCU Stadium site. 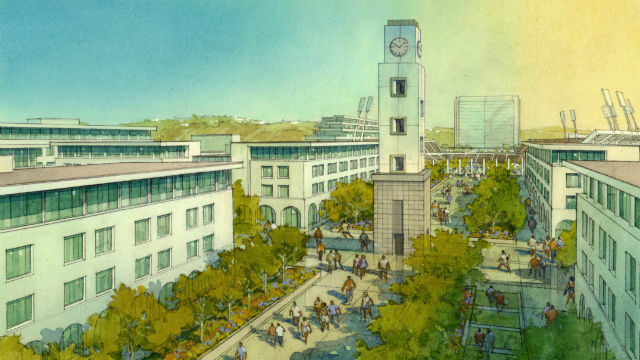 Supervisors Kristin Gaspar, Dianne Jacob and Greg Cox endorsed the measure, known as SDSU West, which would redevelop the stadium site into a new 35,000-seat football stadium for the San Diego State University Aztecs, a river park, retail and residential space and a campus extension. Jacob and Cox are both SDSU alumni. SDSU West is competing against the SoccerCity initiative, officially on the ballot as Measure E. A voter passage of SoccerCity would enable the backing group, La Jolla-based investment firm FS Investors, to build a 23,500- seat stadium meant primarily for a professional soccer team. SoccerCity also includes the river park and residential and commercial space, but does not explicitly include a campus extension the way SDSU West does. The supervisors are the latest in a relatively long and bipartisan list of politicians and organizations supporting SDSU West, including the Lincoln Club of San Diego County, the San Diego County Democratic Party and San Diego City Council members Barbara Bry, Lorie Zapf, Chris Ward, Myrtle Cole and David Alvarez. SoccerCity supporters include former Olympic soccer stars Landon Donavan and Shannon MacMillan, San Diego Mayor Kevin Faulconer and City Councilman Scott Sherman, who represents the district that encompasses the stadium site.